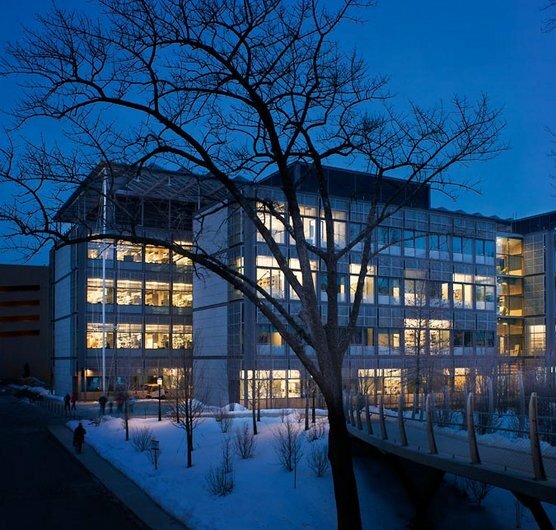 On 9th April Princeton dedicated the Frick Chemistry Laboratory, a 265,000 sq ft new home for the University's Chemistry Department including teaching, faculty and office spaces. When fully operational occupants will include 30 faculty, 30 departmental staff and 250/300 graduate students, postdoctoral fellows and research staff. In addition the teaching laboratories and auditorium will regularly accommodate several hundred undergraduates. The design, which is based around a glazed atrium and a number of social spaces which aim to encourage informal interaction between scientists working across various research projects. This theme continues in the large glazed facade panels which allow views between laboratories and academic spaces to ensure the workings of the department are visible. The design integrates a number of sustainable features including a 63KWatt PV canopy, high efficiency fume hoods, storm water retention and heat recovery on the integrated mechanical systems. A patent on an anti-cancer drug Alimta developed by Professor Ted Taylor has yielded royalties that supported the construction of the project. "When I walk into the new Frick Chemistry Laboratory and take in all the architectural and scientific splendor, I wonder if I am dreaming. Imagine - just at the time I have been asked to chair the Department of Chemistry, Princeton has constructed the greatest academic building for chemistry in the world." David MacMillan, A Barton Hepburn, Professor of Organic Chemistry and Chair, Department of Chemistry, Princeton University. We worked on this project with Payette Associates and Arup.